The 2013 Novices Tournament, the traditional season opener of the notoriously action-packed CUPC calendar, was held at the Cambridge Snooker Centre on Saturday 26th November. A highly talented group of 15 players took part and there was a genuine smorgasbord of gifted potters, canny tactical players and composed positional virtuosos. The CUPC veterans who were organizing the tournament unanimously agreed that it was one of the most hotly contested and riveting tournaments that our imperishable pool club has ever seen. 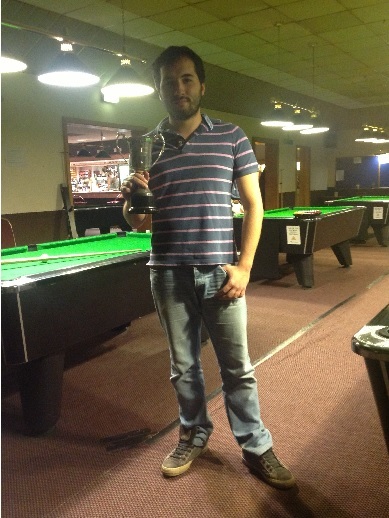 Many congratulations go to the winner Yiannis Stylianidis, who left the onlooking University players fearing for their place in the team by producing some fantastic pool and losing just 3 frames over the whole tournament. With the backdrop of a familiar CSC atmosphere, the group stage begun in earnest. Each group had 4 players, one of them representing the University. Each player played 2 frames against each other and the winner (excluding the Uni player) would go through to the quarter finals from each group. Regrettably, group 4 winner Woody Bu, had to leave before the tournament finished and sadly relinquished his chance to prove his worth in the pressure cauldron of the knockout changes. This meant 2 went through from each of the other groups. This resulted in a play off to decide the runner up of Group 2, won by Kristopher Johannsson. The eight best players. Straight Knockout. Separating men from the boys. Survival of the fittest. It would just come down to who wanted it more. And other such clichés. The final was contested by CUPC league secretary and rising star Tom Pearson, who showed grit, determination and the ability to take advantage of opponents' unlucky fouls in getting there, and eventual winner Yiannis Stylianidis, who had probably forgotten what it was like to lose a frame of pool at this point. Some scintillating pool, agonising dish attempts and relentlessly tight battling from both finalists as they could sense that coveted Novices trophy, but Yiannis pulled out the decisive shots to triumph 4-1.